The Socrates Institute for Therapeutic Immunology is run from the home of a defiant 92-year-old retired biochemist in Philadelphia. It also claims to have found the cure for cancer. Cancer, in all its forms, has been cured. This remains a perceived truth in the corners of the Internet where supplements and conspiracy theories are peddled. A particular cure named GcMAF (short for “Gc protein-derived macrophage activating factor,” which is a chemically altered form of a natural protein that allegedly stimulates the activity of a specific kind of white blood cell) “has the potential to be a universal cure for cancer”, the alternative health and 9/11 Truth website Natural News proclaimed in July 2015. “[GcMAF] is also believed,” the web site also reported, “to be capable of treating and reversing autism, HIV, liver/kidney disease and diabetes.” Rumor has it that GcMAF has the potential to be a cure for even more diseases, such as herpes, as well. GcMAF’s promise as a cure for cancer (and more) has caught up not only those who frequent fringe medical sites online, but also those seeking to profit from it. In 2009, an Israeli pharmaceutical company purchased the intellectual property behind the GcMAF therapy, and since around 2010 at least three companies have been promoting, have sold, or are currently selling, some version of the cure. The founder of one of the most prominent of those companies, David Noakes of Immuno Biotech Ltd., will soon be appearing in court to face charges that include conspiring to manufacture a medicinal product without a license. Although GcMAF is not approved for use as a medical treatment in the United States, some American doctors still promote or discuss its use through their practices’ web sites. Hundreds of pages of online message board conversations document online conversations between gravely sick people wondering if, perhaps, this storied cure will be the one that finally saves them. Inevitably, these conversations end up pointing to shady web sites purporting to sell the GcMAF cure. An international crackdown on the promotion and sale of this “wonder cure” in late 2015 pushed its promoters deeper and deeper into the fringes of the Internet, allowing GcMAF to become the original basis for a wildly incoherent (and completely false) conspiracy theory about “holistic doctors” being murdered by some ill-defined cabal of nefarious government agents furtively working on behalf of the pharmaceutical industry. In a sense, GcMAF is the perfect cure to appeal to the Internet’s pseudoscientific alternative health underbelly, even if that audience was perhaps not GcMAF’s original target. On these web sites, the primacy of “natural” cures over man-made ones reigns blindly supreme, and one of the most popular tropes used by these sites to play into that narrative is that a “supplement” (which is how GcMAF is typically marketed) is a tool that allows your body to do the dirty work of curing what ails you without the need for any of those nasty man-made pharmaceuticals. That, in theory, is what GcMAF is supposed to do. GcMAF, according to those promoting that cure, is a chemically altered form of a molecule naturally found in human blood that, when injected into the bloodstream, stimulates the activity of macrophages, a crucial form of white blood cell that can (in essence) ingest a variety of foreign substances found in the bloodstream or in other tissues they migrate to. There is one other chemical crucial to the purported mechanism behind GcMAF: an enzyme dubbed NaGalase. The idea behind it, as presented primarily by the work of a single scientist, is that cancerous cells (and other diseases) are capable of shutting down macrophage activity by releasing this enzyme. That enzyme makes those macrophages dormant, the argument goes, thereby making it harder for your body to fight a cancer and other ailments. Inject your body with some GcMAF, and these macrophages escape their “zombie” state and get right to work — or so its promoters claim. In scientific studies, GcMAF’s efficacy has been tested by using NaGalase as an indicator for cancer load or other ailments, with a decrease in NaGalase being a sign of efficacy. In a fairly open and shut case of circular logic, however, both GcMAF, and the NaGalase test that is meant to monitor GcMAF therapy, were patented by the same man: Dr. Nobuto Yamamoto. 2. THE PIONEERIt would be easy, looking at the claims made of his research, to dismiss the self-described pioneer of GcMAF as a snake oil salesman, but a deep dive into his career does not offer such an easy out. Dr. Yamamoto, now 92 years old and (as he told us over the phone) still actively engaged in research, has had what can easily be described as a long and very productive career as a scientist. With a publishing record going back at least to 1957 to the present, he has seen his work published in some of the world’s most prestigious scientific journals, including a 1964 paper in Science and multiple papers in Proceedings in the National Academy of Sciences. Dr. Yamamoto, who holds a PhD in biochemistry from Gifu University in Japan, has been a US-based researcher since 1959, when he was invited to be a visiting associate researcher at the Fox Chase Cancer Center in Philadelphia. He was later hired as a biophysics and biochemistry researcher at the National Institute of Health in Maryland before becoming associated, in multiple capacities, with Temple University in Philadelphia until 1980. He then took a post at the Hahnemann University School of Medicine, now a part of Drexel University (also in Philadelphia). 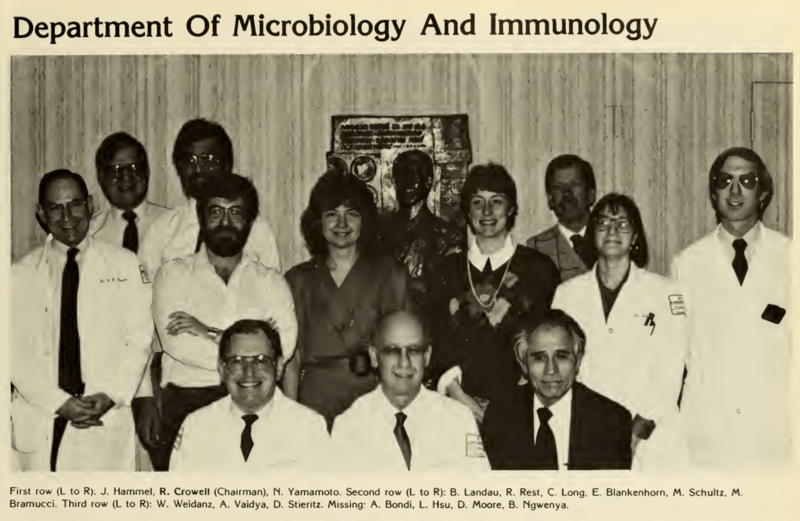 In 1987, as a professor at Hahnemann, Dr. Yamamoto published a paper in the journal Cancer Research that would become the basis for the concept he later termed GcMAF. He officially left academia in 1993, but then took a post at a private hospital named the Einstein Medical Center in Philadelphia, and it was there that he began focusing myopically on GcMAF, publishing a number of early papers relevant to GcMAF. It is clear, at the very least, that Yamamoto ran into serious problems with the administrators at Einstein around that time. Although a media representative for Einstein initially denied to us that any records supported the claim that Yamamoto had ever worked for them, a human resources representative there later confirmed to us that Yamamoto’s employment, which began in June 1993, was terminated in June 1999. A variety of partial or unverified accounts of why this may have happened, but no definitive answers, have been offered. We found no definitive proof that Yamamoto was fired from his position at Einstein for any kind of misconduct, although the lawsuits he filed against his former employer suggest that he was portrayed in a negative way to which he objected, and that around that time his employment was terminated. Einstein would not confirm the details of Yamamoto’s termination or acknowledge the lawsuit, and although we sent multiple requests for comment to an individual listed as a defendant in that case, we received no response. Nonetheless, it was around the time that Yamamoto left Einstein that he began to describe himself as director of the Socrates Institute, which is located in his home. His six-year publication hiatus ended in 2006 with his paper about the utility of NaGalase as an indicator of progress for AIDS treatment, and beginning in 2008 he published the four papers most frequently cited in favor of GcMAF’s efficacy against both AIDS and cancer. The most notable of these papers, published in the International Journal of Cancer, claimed metastasizing breast cancer cells had been successfully destroyed with GcMAF. Another 2008 paper, this one published in Cancer Immunology and Immunotherapy, claimed that GcMAF was effective as a treatment for colorectal cancer. A 2009 paper published in the Journal of Medical Virology, made the astounding claim that HIV-infected patients were “rapidly cured” by GcMAF therapy. The inclusion of these three papers in scientific literature would be short lived, however. By 2015, these papers had all been retracted by the journals that published them, thanks to the work of the Anticancer Fund, a Belgian-based NGO that “investigates the information on cancer therapies for evidence, so that evidence-based treatment choices can be made”, according to their website. “After several patients asked our organization […] about GcMAF as a cancer treatment, we decided to look for the evidence supporting its use in cancer,” they told the academic watchdog Retraction Watch in a July 2014 article. The Anticancer Fund’s main scientific problem with the research behind those papers, laid out in a statement posted on their web site, was that the researchers did not actually measure tumor growth or decline directly but instead relied on NaGalase, which the researchers had claimed as an accurate measurement of tumor load in a human body even though it is not widely accepted as a valid analytical tool for this purpose. Nonetheless, it wasn’t those scientific concerns that lead to the retractions of Yamamoto’s papers: the main issue was that little (if any) independent documentation existed about the patients involved in the studies or their approval for participation in medical trials. The official justification for each of these retractions, according to statements provided by the respective journals, was that they were due to “irregularities in the documentation for institutional review board approval”. In essence, this meant the journals felt the papers’ authors could not adequately prove that their trials had been approved by any academic board, or had been conducted in the manner claimed in those authors’ subsequent papers. We spoke to Ana Ugarte, a doctor and medical researcher involved in the Anticancer Fund’s investigation of GcMAF, about the issues that resulted in the retraction of the three papers prepared by the Socrates Institute. Contrary to the muted and official tone taken by the Anticancer Fund, the process behind the investigation led Ugarte, and later us, down what can only be described as an increasingly absurd rabbit hole. Although the Anticancer Fund never explicitly made such a claim in any of their official publications, Ugarte personally suspected that the Socrates Institute, which shares the address of Yamamoto’s private home and was established as tax-exempt organization in November 1998, was, by and large, a made-up entity. Perhaps the most consequential aspect of Socrates Institute revolved around a man named Hirofumi Suyama, who retired from the Nagasaki Medical school in 1987. Although Suyama was credited as an author in a number of Socrates publications and was listed on tax documents as vice director of the Socrates Institute in 2007, Suyama had not published anything since 1991. The Anticancer Fund’s Ugarte tried fruitlessly to get in touch with this man, but according to Yamamoto, Suyama died in July of 2011 (although tax documents listed him a vice director of Socrates in 2011). Yamamoto did not directly confirm Suyama’s death to us (and we have been unable to independently verify whether Suyama is dead or alive), but he used Suyama’s passing as an explanation for a lack of complete documentation regarding the approval of the clinical trials he published data from to the editor of Translational Oncology. The IRB which Yamamoto claims signed off on his research was allegedly convened in 1995 at a research institute in Japan. As far as we can tell, however, the only documentation of this review committee is the cover page of a press release Yamamoto provided to editors of Translational Oncology (below) when asked to document his IRB approval. Additional details of this review process appear to have died with Suyama — at least, according to Yamamoto. Echoing the concerns of the Anticancer Fund, Dwight McKee, an oncologist with an interest in integrative and alternative treatments for cancer who began to work with Yamamoto on clinical trials of GcMAF around 2009, told us he was unnerved by some of the ethical decisions Yamamoto was making. McKee told us that, for the medical trial he was collaborating on with Yamamoto (whose data he said were not published), Yamamoto was attempting to register American stage four cancer patients for a medical trial using IRB approval from a foreign institution. McKee told us that he had his own lawyer look into the legality of entering patients “on an informed consent, clinical trial, through a foreign university” and found that it was a grey area but “probably not completely defensible.” McKee said he thought at the time that he and Yamamoto were conducting a legal and legitimate clinical trial, but, he said, “it was much fuzzier than that”. The two parted ways after these revelations. Aside from these ethical concerns about research methodology, it appears that many members listed as both authors and directors at the Socrates Institute actually had little, if anything, to do with that organization. Suspicions of potentially deceased people working for the Socrates Institute are not limited to Dr. Suyama: Socrates’ 2011 tax filing also lists Theodore Sery, a collaborator with Yamamoto in the 1990s, as a “trustee”, although Sery died in January of that year. Indeed, the group of principal employees of the Socrates Institute seems to be composed of retired professors who have (what sometimes appear to have been tangential) relationships to Yamamoto’s academic past, or who are former postdocs or students of Yamamoto’s from decades prior. According to tax filings, none of the members listed as directors or trustees of Socrates has ever received any compensation, and the majority of the institute’s expenses appear to be publication fees. Perhaps the most enigmatic piece of information obtained through examining tax records is the inclusion of a man named Nobuyuki Yamamoto as a deputy director of the Socrates Institute between 2005 and 2007. Based on records we obtained in addition to the address listed on tax filings, Nobuyuki is Yamamoto’s son. However, prior to our informing the senior Yamamoto of our possession of this information, he told us that Nobuyuki Yamamoto was not his son; then, when confronted with this evidence, Yamamoto then corrected himself. This reversal could be, perhaps, written off as a slip of the tongue, but it needs be mentioned that there is in fact another Nobuyuki Yamamoto who does cancer research and has a publishing history that is superficially similar to the work performed at Socrates. This other Nobuyuki Yamamoto is evidently unrelated to Nobuto Yamamoto (we reached out to the former and received no response), but his sharing a name with Nobuto Yamamoto’s son serves, either intentionally or accidentally, to insert the work of the Socrates Institute into the same scientific literature searches as genuinely legitimate, but wholly unrelated, research. The Nobuyuki affiliated with Socrates, who we presume is Nobuto’s son based on our conversations with the latter, is listed as an author on a number of the 2008 and 2009 papers as well. The Nobuyuki Yamamoto at Socrates is not a medical researcher or a practicing scientist, however: Nobuyuki has a masters degree in marine microbiology, and now in his sixties, he works as an IT director at West Chester University. One could make that argument that none of these perhaps superficially minor discrepancies matters if Yamamoto’s science holds up, a point that Yamamoto firmly, and to our ears sincerely, stands by. Such an argument, however, ignores the role that academic or professional research institutions have in ensuring that research that is conducted ethically and without bias. Because of his position outside of accredited physical institutions, Yamamoto seems to have developed a disregard for the foundations of the scientific process, most notably, the accurate representation of scientific participation and consensus. That viewpoint is explicitly evident in the authorship of one of the papers that, despite the Anticancer Fund’s best efforts, remains unretracted. 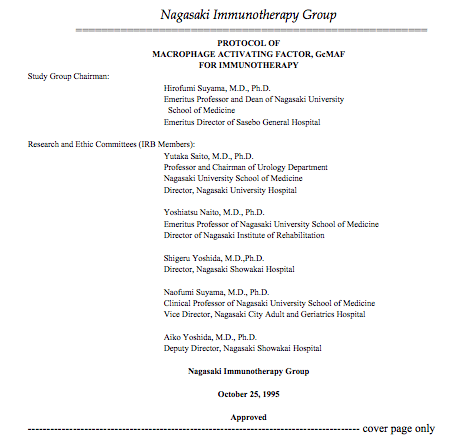 That paper (“Immunotherapy for Prostate Cancer with Gc Protein-Derived Macrophage-Activating Factor, GcMAF”), published by Translational Oncology in 2008, lists Nobotu Yamamoto, his son Nobuyuki Yamamoto, and Hirofumi Suyama (a man who retired from active research in 1987) as authors. This seemingly false representation of consensus has ramifications far outside the scientific realm. 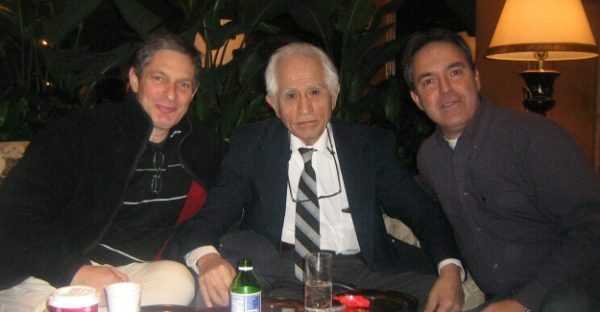 Nobutu Yamamoto, center, with Efranat co-founders Boaz Shoham (left) and Avi Levin (right) from an archived version of that company’s website as it appeared in 2013. Beginning in 2010, following the publication of the Socrates papers, a separate online entity unrelated to Efranat Macrophage appeared that gradually evolved into David Noakes’ Immuno Biotech, a firm that produced and heavily promoted GcMAF (which cannot be legally marketed). “One time our patent lawyer tried to sue Noakes in England but he escaped,” Yamamoto said in a letter to the editor of Translational Oncology. Jeffrey Bradstreet was a controversial American doctor involved with Noakes’ Immuno Biotech. Bradstreet, who had previously published a number of papers suggesting that GcMAF could “cure” children with autism, and his suicide following a raid on that company (and his own clinic) spawned the aforementioned conspiracy theories about the government’s and Big Pharma’s merciless goal to hide a cure for cancer. The raid on Immuno Biotech’s production facility that preceded Bradstreet’s death revealed that materials used in their production of their GcMAF (i.e., blood plasma) were explicitly labeled that they not be administered to humans or used in the production of drugs. Yet another group in Japan created and patented what they call “second generation GcMAF,” announcing the therapy in a misleading advertisement in the journal Nature Outlooks that was formatted to look like a peer-reviewed study (and has been cited as such). This company still actively promotes and sells GcMAF products, according to their web site. Aside from the safety issues created by the undervetted promotion of GcMAF by online profiteers, the viral promotion of conspiracy theories suggesting that sinister government or corporate entities are purposely keeping GcMAF from the public means that those who search online for cures for cancer, AIDS, or other ailments in the wake of terrifying diagnoses are likely to find information about GcMAF and led into believing in what is almost assuredly a false ray of hope. That ray of hope would be misleadingly supported by the appearance of legitimate-looking research presented by an institute run from a retired scientist’s home: Although three of the papers from the Socrates Institute were retracted, PDF versions of them are still in wide circulation without noting their retractions, and other GcMAF papers are still part of the scientific literature. Translational Oncology, after receiving the same responses from Yamamoto that we were able to obtain, declined to retract Yamamoto’s paper asserting that GcMAF may be a therapy for prostate cancer. The Socrates’s Institute’s 2006 paper on the utility of NaGalese as an indicator for AIDS, published in the journal AIDS Research & Human Retroviruses, remains in the record as well. Legitimate questions remain to be asked of other papers that have been published without the knowledge of the people who are listed as their co-authors, as was the case with Sucha Asbell in 1996. That paper, and a number of others from Yamamoto’s Einstein Medical Center years, are also still part of the scientific literature. One could argue Yamamoto’s most evident transgressions were the desire to protect the intellectual property resulting from his work, and to be considered as a legitimate scientist when he was without an institution to support his efforts. Such an argument ignores the fallout created by proliferation and support of this kind of research, which gives false hope to patients, enables Internet hucksters, and leads to potential delays in more effective treatment. This proliferation of questionable research also masks the legitimate concern that Yamamoto’s unyielding faith in his own work may cloud his responsibility to present it objectively. Dr. McKee, the man who left Yamamoto’s lab for legal and ethical reasons, told us that GcMAF seemed to have some anticancer properties but “it was not of the degree that Dr. Yamamoto believed it to be”. He also told us that he thought it could possibly be a useful medicine, but that it would need to be combined with other therapies. Dr. Yamamoto, he said, wanted it to be the cure for cancer. Yamamoto, for his part, tells us that the Socrates Institute has a groundbreaking paper coming out soon, alleging that GcMAF can be a cure for “all disease.” Let us hope that this time, the Internet and the scientific publishing system will be ready to put these forthcoming results into the context they require. Correction [11 September 2017]: An earlier version of this story stated that Efranat Macrophage's work pivoted to other similar medical concepts divorced from Yamamoto's name after his paper's retractions. In fact, Efranat is still working primarily with GcMAF, it has merely been renamed EF-022. Natural News. 27 July 2015. Natural News. 28 August 2015. BBC News. 27 September 2015. Health Nut News. 17 August 2015. Natural News. 14 March 2016.
timsmithmd.com. Accessed: 29 August 2017. Journal of Bacteriology. April 1958. Proceedings of the National Academy of Sciences. January 1969.
International Journal of Cancer. 12 October 2007. Cancer Immunology, Immunotherapy. July 2008. Journal of Medical Virology. 21 November 2008. Retraction Watch. 25 July 2014. Nature Outlooks. 31 May 2012. AIDS Research and Human Retroviruses. 17 March 2006.